Think what Detroit meant in 1945 and what it represents today. Once the very symbol of American prosperity and the American Dream, Detroit has run out of gas. For decades the Motor City was the greatest manufacturing city in the world, unmatched in industrial strength, no more so than during WWII. Obama bailed out the auto industry four years ago, reviving a once flourishing industry, but there was a time when the Detroit Auto Industry basically bailed out the US Government. During WWII Detroit was at the center of the greatest concentration of applied science and technology the world had ever seen. Factories broke every previous production record and poured forth a flood of goods, unleashing American productive and technological genius. 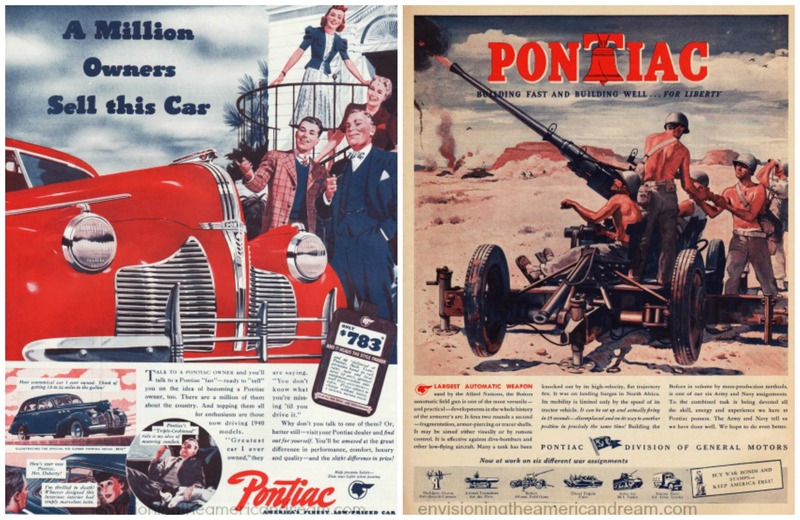 The wartime transformation of Michigan’s automotive industry and its massive contributions to winning the war are well worth remembering. 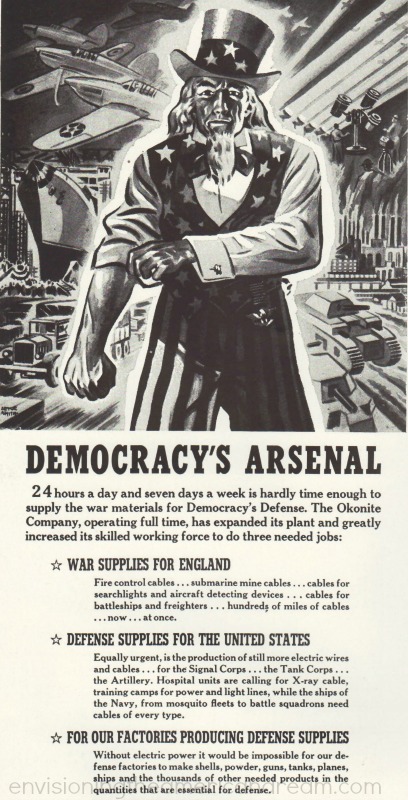 A year before America entered the war, while Hitler ominously goosestepped across Europe, President Roosevelt challenged the nation to become the worlds “arsenal of democracy.” In a speech delivered at the end of 1940, FDR made a “call to arm and support” the Allied Powers, imploring Americans to stand up as the arsenal of democracy as though it were their own war. 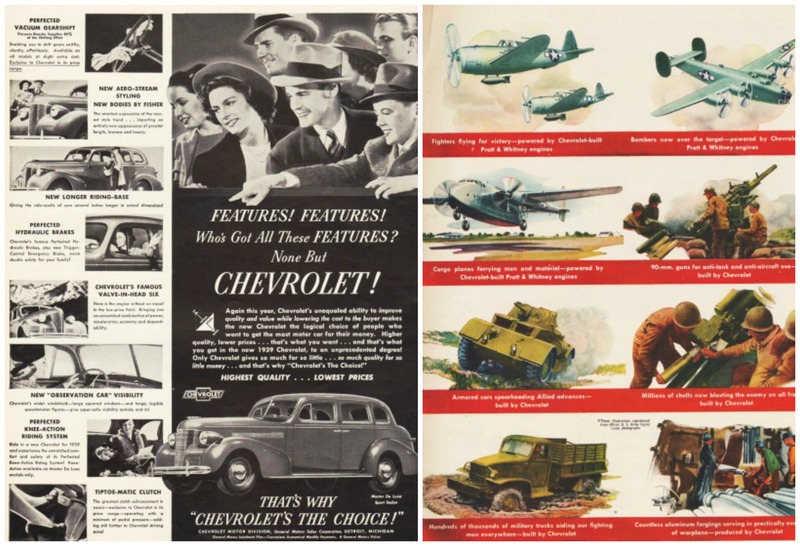 As American industry rushed to respond, GM, Chrysler, Ford and others rose to the occasion in a big way, producing both “guns and butter” until out of the blue came December 7, 1941 and the industry shifted to all out war supplier. After Pearl Harbor what had been defense production became war production as the car manufacturers turned entirely to the manufacturing of military trucks, planes, engines, weapons, and ammunition. 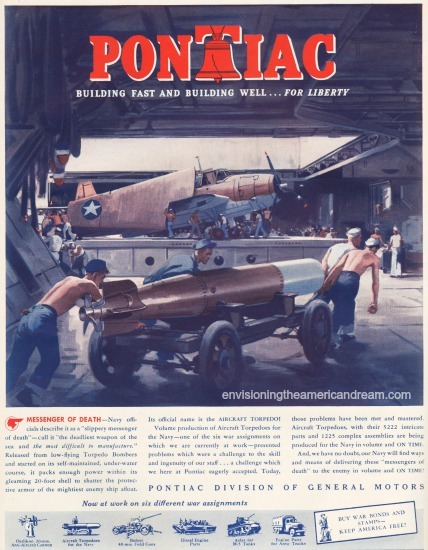 Pontiac was still producing torpedoes only now it was volume production of Aircraft torpedoes, the deadliest weapons of the sea and the most difficult to make. 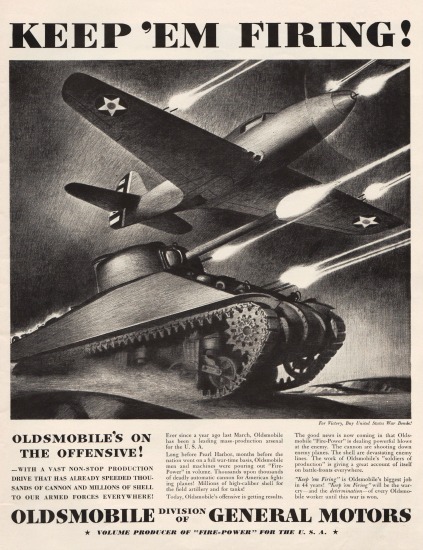 “Ever since a year ago last March (1941) Oldsmobile has been a leading mass production arsenal for the USA,” we are proudly informed in this 1942 ad from Oldsmobile . 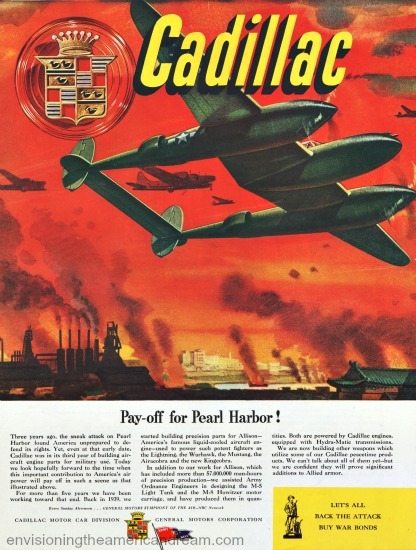 “Three years ago the sneak attack on Pearl Harbor found America unprepared to defend its rights.” begins this 1944 ad from Cadillac. 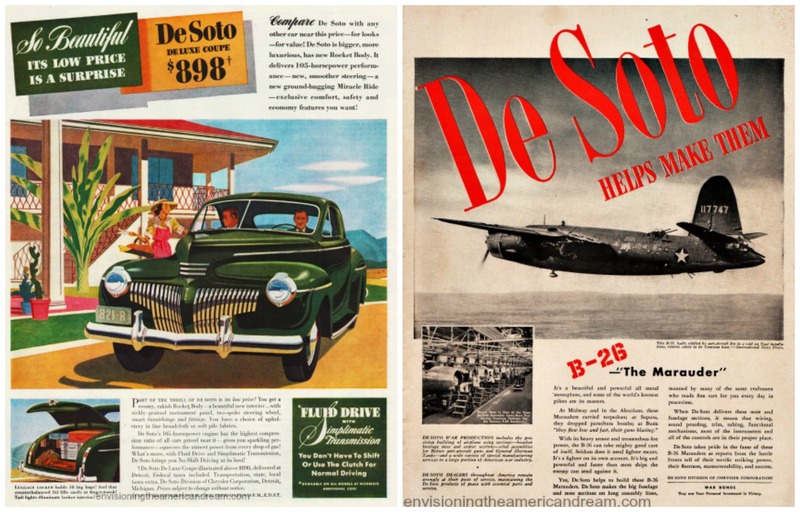 (L) Vintage ad De Soto 1941 -Bigger, more luxurious, has new rakish rocket body! 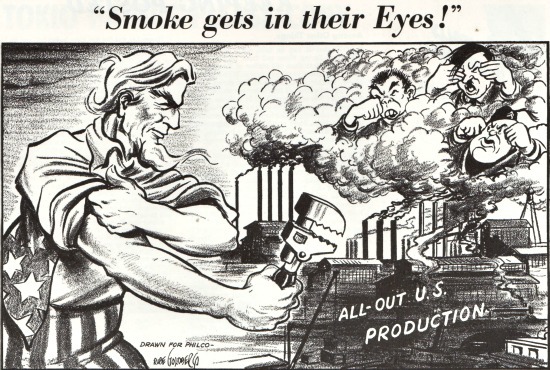 In a speech to Congress in January 1942, FDR called for “a crushing superiority of equipment” setting a staggering production goal for America. Civilian production was soon halted and manufacturers converted to war production. 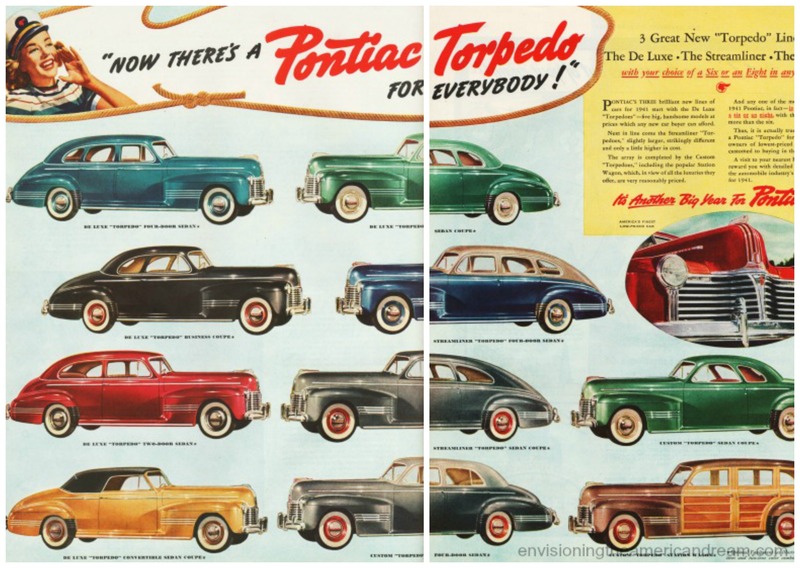 A month later, the last big shiny American cars rolled off the assembly lines, and car loving Americans would have to make do with their pre-war models for the duration. Ol’ Tojo, may have thought he hit us below the belt, gloating that: “American’s exercise of freedom to choose” had made us soft and weak and unfit for war making…but boy what a sucker he turned out to be! Masters of mass production, Americans began retooling to become masters of mass destruction. Manufacturers were working night and day, turning radios into radar, and Fords into fighter plane. American manufacturers sure weren’t pullin’ any punches. They were working head over heels, night and day, building essential war materials. 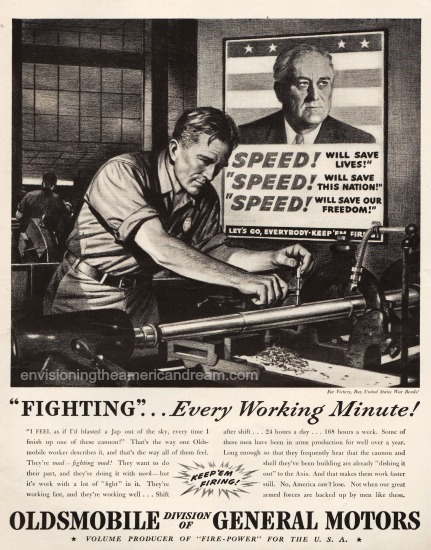 By 1943 , “More, better, sooner” was the war cry of Detroit’s soldiers of production. 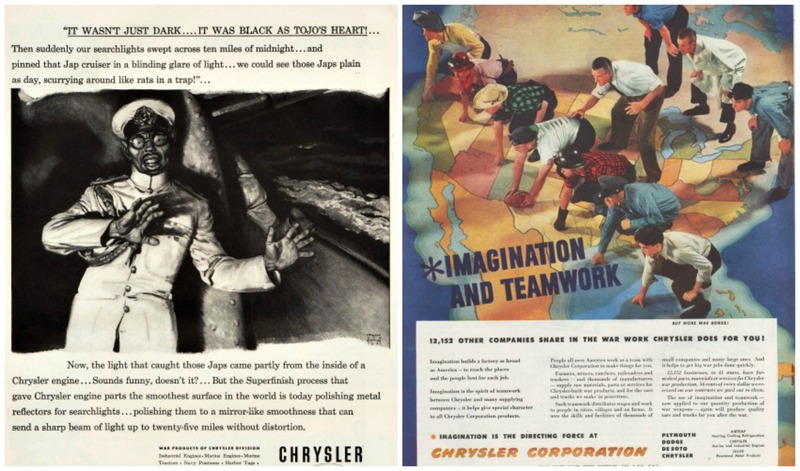 “We have a job to do..the biggest job that has ever faced the minds and muscle of American industry”, stated the copy an ad that ran in 1942 that pretty much sums up the determination felt by all American workers. War unleashed and mobilized the powerful energy of American production it gave workingmen jobs and made them part of a quest whose goal was the killing of the hydra-headed Fascist monster. This Ones For You Tojo! 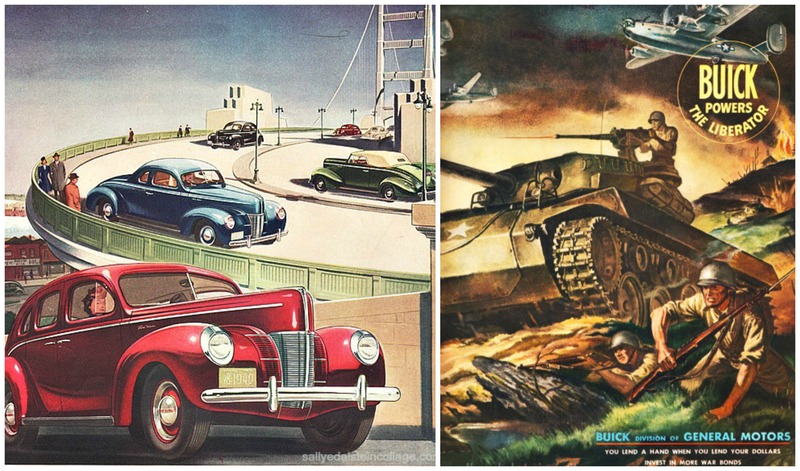 When it came to tanks, you wouldn’t you really rather have a Cadillac? My affinity for this era of US history forces to to say this is one of your best post. Wonderful. Thank Bart…this is such an important part of history and deserves to be remembered. I will be posting 2 posts continuing this subject next week. Postwar European factories were smoldering heaps which should be taken into account of your overall picture. That was the very tragic result of war. America was fortunate to have been unscathed by the terrible destruction that Europe and others experienced. …and the fact that those European and Japanese factories were in rubble meant that they were rebuilt – with American assistance – using newer technology and greater efficiency than the American plants. Modern steel plants in Japan and Europe helped put American companies out of business. Perhaps the American worker would have been better off had we let the Soviets take Western Europe and Japan? What killed the American motor industry was the same thing that killed the UK motor industry…poor management and hidebound unions ..the refusal to see the writing on the wall…that’s why people loved Honda’s and Toyota’s…reliable and cheap…not everyone wanted a 7litre SUV.. Yes, you are absolutely right about that, and despite the retooling to make smaller more economical fuel efficient cars, it was a bit too late. 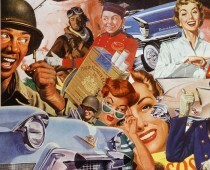 The U.S produced some 3 million trucks and countless parts in WWII. They went through the Army’s Fort Wayne Ordnance Depot in Southwest Detroit and its subsidiary locations, a historic site now called Historic Fort Wayne, which I manage. Three of our 1942 warehouses are still being used by the Detroit Historical Society. Thank you for your beautiful website documenting our area’s role in saving our way of life! Thank you for your information. Is my honor to present this terrific story that neede to be told and remembered. The destruction of Japan and Germany’s factories have NOTHING to do with American prosperity after the war. Contrary to wide spread belief all our prosperity was based soley on domestic production and consumption. America never had a very big export economy until the 1970’s. As for Unions causing the deline, David Dempsy and Sallyedelstein are totally wrong. Bad management and engineering did the industry in. Cars made in the latter part of the 1960’s on ward were designed like crap; Rusting at 20,000 miles, engine leaks, etc. Also managements refusal to change in the face of the gas crises. I did..in part say that..but I quote an article by Martin Hutchinson. The first is notorious – GM has a major cost disadvantage: When foreign automakers had no automobile factories on U.S. soil, GM could – and did – allow the United Auto Workers (UAW) union to ramp up costs ad infinitum. Any cost disadvantage that GM thereby acquired compared to foreign brands produced in cheaper-labor economies could be overcome through careful lobbying to provide barriers against excessive imports. However, the arrival and establishment of foreign-owned manufacturers in America’s less-unionized states – combined with the inexorable aging of GM’s former and current work force, which greatly increased the U.S. automaker’s health and pension costs – shackled GM with an impossible cost disadvantage against its competitors. Some of that disadvantage is now being slowly negotiated away, but without a GM bankruptcy it seems most unlikely that the company’s costs can be brought down to competitive levels. Second, GM has been bedeviled by government regulation: One great example is the Corporate Average Fuel Economy (CAFÉ) standards introduced in 1975. 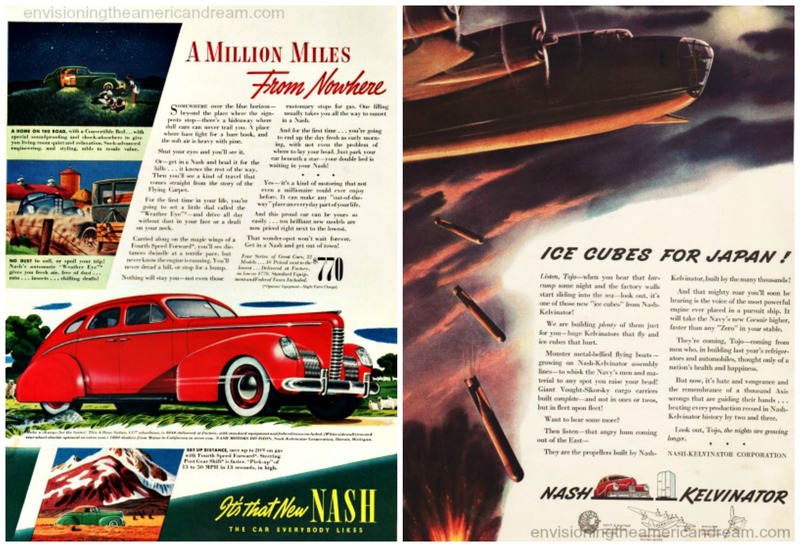 As a specialist in the traditional large cars that the U.S.-consuming public favored, GM was badly affected by the CAFÉ standards that, by mandating average fuel economy ratings for the entire fleet, enormously benefited Japanese and other makers that specialized in small cars. Eventually, GM and the other U.S. manufacturers found a loophole, and developed the sports utility vehicle (SUV) that, being based on a truck chassis, was not subject to the CAFÉ restrictions. By the time Chrysler, Ford and GM made that discovery, however, the damage – in terms of market share – had been done. A further round of tighter CAFE restrictions introduced in 2007, this time including SUVs, has once again imposed gigantic development costs on GM, making its entire product range obsolete. A moderate gasoline tax, particularly one introduced over a lengthy period, would have been far less disruptive to the market, and to GM’s operations. It would also probably have achieved rather more in terms of fuel economy and combating global warming. “Cap-and-trade” regulations, as proposed by the Obama administration, will further increase GM’s costs, providing the biggest relative benefits to manufacturers in such low-wage countries as China and India that are not subject to such impositions. 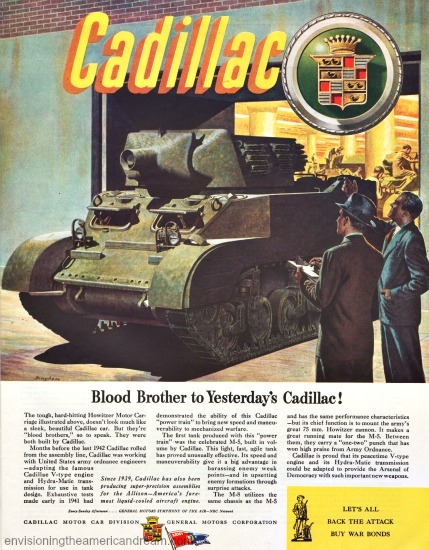 However, the principal threat to GM’s competitive position, one which Wagoner’s departure will intensify, is the “culture war” between the upscale bi-coastal opinion formers and the general U.S. public: In 1970, the standard upscale car for all but the very rich was a Cadillac, a Lincoln, or a Chrysler Imperial. This was as true in New York as it was in Detroit or Dallas; only a small minority of consumers bought top-of-the-line foreign cars, generally with academic pretensions. Equally, for the upper-middle bracket, Buick or Mercury was the choice of the vast majority. Today on the East and West coasts, consumer tastes are very different. Saloon Cadillacs and Lincolns are rare; the upscale driver generally chooses a Mercedes, BMW or Lexus. Only among those with families (such as the Obamas) is a large SUV sometimes chosen, although generally an imported one. Buick now sells far more cars in China than in the United States; the traditional Buick or Mercury driver on the East or West coast has migrated almost entirely to import models.